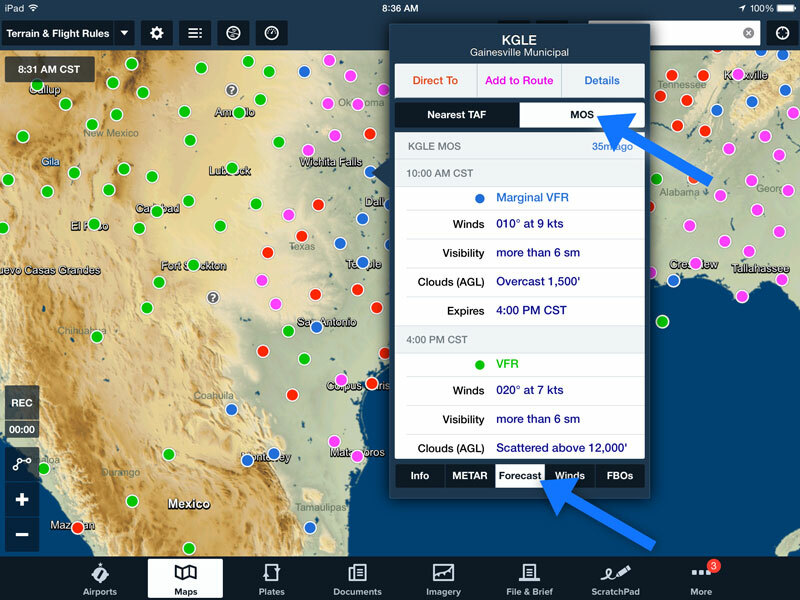 Back in December we announced a new forecast tool in ForeFlight Mobile called Model Output Statistics or MOS. A TAF-like forecast, MOS provides site-specific weather guidance to pilots for hundreds of airports where a TAF is not provided by the National Weather Service (NWS). We’re happy to say that we’ve taken MOS even further. Not only have we added over three hundred additional MOS airports to ForeFlight Mobile, but we’ve extended the MOS guidance from 24 hours to 3 days. That’s right, in ForeFlight Mobile 2,032 stations throughout the U.S. and its territories now have a TAF-like MOS forecast with site-specific weather guidance out to 3 days in the future. Pilots can now get a forecast of wind direction and wind speed, ceiling height, ground visibility and precipitation similar to what you might see in a TAF, now extended to 72 hours for over 2,000 airports. This means that even when the TAF stops at 24 or 30 hours, MOS continues to provide site-specific weather guidance beyond the forecast timeframe for over 700 NWS TAFs. The MOS forecast option is available to all subscribers with ForeFlight Mobile 6.6 and to find it in the app, simply select an airport or station from the Maps view. In the pop-over window, tap the Forecast tab at the bottom. Then press the MOS button to reveal this forecast product and scroll through the MOS forecast over the next three days. Access the MOS forecast in the Maps view by tapping on an airport. This entry was posted in Weather and tagged aviation weather, foreflight, iPad by Scott Dennstaedt. Bookmark the permalink.